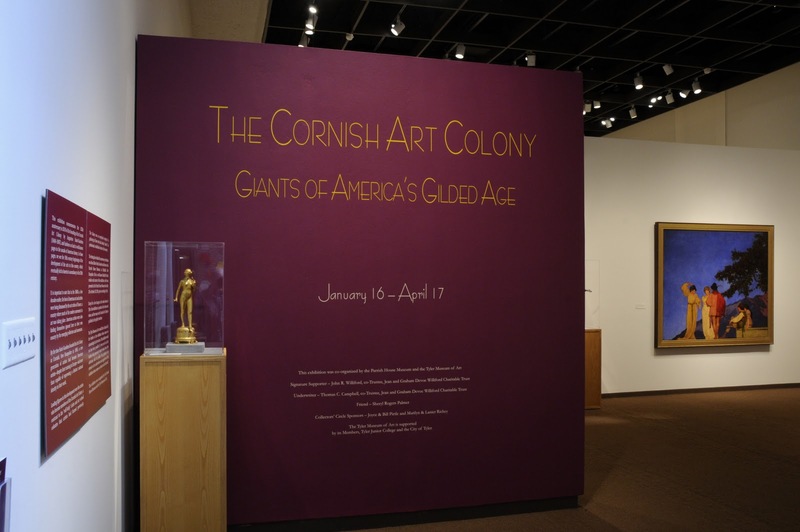 (TYLER, TX) February 1, 2011 – This week at the Tyler Museum of Art, visitors will enjoy a free First Friday Art Tour of the exhibition The Cornish Art Colony: Giants of America’s Gilded Age beginning at 11 a.m. on Friday, February 4 in the Museum’s North Gallery. The tour will provide an overview of major works included in the exhibition, with a focus on the women of the Cornish Colony. First Friday Art Tours are free, but exhibition admission fees apply; tours usually last under an hour. Admission to the exhibition is free for TMA Members, $7 for adults, $5 for students and seniors, and free for children ages 12 and under. One of the most important art colonies in the United States, the Cornish Art Colony was located in New England and was made up of celebrated artists from major art centers such as New York, Boston and Philadelphia. The Cornish Art Colony was founded by Augustus Saint-Gaudens (1848–1907), who traveled to Cornish, New Hampshire in search of an Abraham Lincoln-type model for his Standing Lincoln bronze sculpture commissioned by the City of Chicago. The artist was soon joined by his friends in the arts who thought that the location provided a perfect place, away from the city’s summer heat, where they could congregate as like-minded individuals and create their art in an idyllic setting. The area’s bucolic hills and meadows, trickling streams and majestic mountains provided endless inspiration to the group of artists who gathered there. Maria and Thomas Dewing, Bessie Potter and Robert Vonnoh, Mary and Frederick MacMonnies, Kenyon Cox, Stephen Parrish and his son Maxfield, and Frederic Remington are important American artists who are among those hailing informal membership in this influential group. The Cornish Art Colony: Giants of America’s Gilded Age was co-organized by the Tyler Museum of Art and the Parrish House Museum, Plainfield, New Hampshire. Guest curator of the exhibition is Alma Gilbert-Smith, Director of the Parrish House Museum. Signature Supporter is John R. Williford, co-Trustee, Jean & Graham Devoe Williford Charitable Trust. Underwriter is Thomas C. Campbell, co-Trustee, Jean & Graham Devoe Williford Charitable Trust. Friend is Sheryl Rogers Palmer. Collectors’ Circle Sponsors are Marilyn & Lanier Richey and Joyce & Bill Pirtle.